The battle between juried science and pop science raged in 1875, as Thomas Alva Edison announced in the Newark NJ newspapers a new scientific finding which he called “etheric force”. 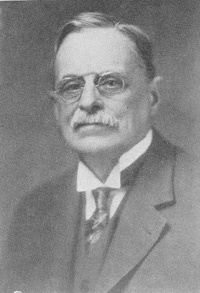 Elihu Thomson (later Acting President of MIT twice between 1920 and 1923) countered Edison's announcement with a careful study published in the scientific journal, Journal of the Franklin Institute. Come to see and hear about these papers of Elihu Thomson and other Treasures of the American Philosophical Society. As a special treat at no additional cost, arrive at 4:30, one hour before the main presentation, for a guided tour of the Charles Darwin exhibition - Dialogues with Darwin - in Philosophical Hall, located across from the APS Library on Fifth Street. 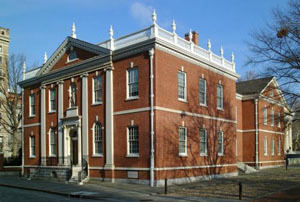 At 5:30, our main presentation meets at the American Philosophical Society Library with address at 104 South Fifth street (NOTE - the entrance is on Library Street). Mr. Roy Goodman (Assistant Librarian) will present a talk on Elihu Thomson’s papers and other documents and artifacts from Charles Darwin to Lewis and Clark that are housed in APS archives. Following the Treasures of the APS presentation, we meet in the Jefferson Garden for a reception with wine and cheese and hors d’oeuvres until 7:00. Mr. Goodman and members of the APS staff will join us for the reception to allow time for questions. ( In case of rain, the reception will be moved indoors to the 2nd floor of Philosophical Hall.). Many thanks to MIT alum and APS Member Peter Silverberg (1960, Course X) for arranging this event. "Thomson was a lecturer in electrical engineering at MIT from 1894 to 1937 and was a Life Member of the Corporation from 1898 to 1937. He held more than 700 patents. The firm he co-founded, Thomson-Houston Company, merged with Thomas Edison’s Edison Company to form General Electric in 1892."